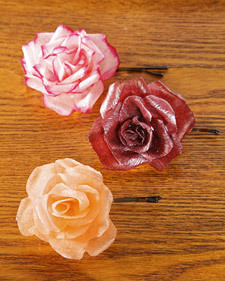 DIY Project: Crepe Paper Rose Barrettes, Pins or Decor! Martha Stewart is having her yearly Valentine’s Day workshop right now so her show is full of all kinds of pretty Valentine’s themed crafts and projects! One of the projects she featured this week were small crepe paper roses that I thought would be beautiful for weddings too! While she explains how to make the roses and turn them into barrettes, you could choose to make them into something else too if you like! First, cut out three 6.5″ by 2.5″ rectangles from your doubl sided crepe paper. Next, print the template! Then cut out the rectangle containing the petal shapes and stack them on top of the three paper rectangles. Staple into place. Now, cut out the petals! You will end up with three tear-drop shaped petals and nine heart shaped petals. To shape the petals: Cup in center; Wrap left and right top edges around a toothpick to curl. Build the flower by placing the tear drop petals first, and then the heart petals around eachother, holding onto the bottoms. Fasten the petals in place by wrapping wire around the base, then wrap the wire around a bamboo skewer. Secure with glue. Mix Smooth-Cast 327 according to manufacturer’s directions. Dip the flower into the mix and shake off excess. Insert bamboo skewer into Styrofoam while the flower hardens. Repeat for a second coat. Use pruners to snip off the “skewer stem”. Finally spray both sides of the flower with the krylon matte spray and allow to dry. To complete the rose, cut out the leaf shape from the template and trace it on your green felt. Cut out your leaf! If you are making a barrette or pin, glue the barrette or pin backing to the back of the flower and then cover it by gluing on your green felt leaf. If you plan on using the roses simply as pretty decor, skip gluing on the barrette or pin and just attach the felt leaf! That’s it! When complete you will have a pretty crepe paper rose that is actually pretty durable since you sealed it with the smooth cast and the finish spray. Some ideas for their use..
Pin it into your pretty wedding hair, make one for each of your bridesmaids hair..or put some in the hair of your flower girls! You may choose to scatter them around your cake on your cake table for decoration, or even around the center of the guest tables as an addition to your centerpieces! Something that may be worth trying would be threading the backs of the roses with monofilament or clear fishing line, securing with glue..Then you could have pretty strands of raining crepe paper flowers to hang as decor! You may need to thread them before sealing them though..I’m guessing the seal may make it hard to shove a needle through! You may be able to avoid the threading all together and just glue them directly to the monofilament and hide/secure the glue job with your green felt leaf! These are just a few ideas..If you create these pretty flowers for your big day we’d love to see!